Website template, or page template, is a pre-designed web page that can be used and customized for projects and other various reasons. Each of these template designs varies with their layout and theme depending on the purpose, specificity of the design, its target visitors, and more. With all of these factors to consider, you can just imagine how daunting it is to create an effective web design. That’s why having a web template can be a lifesaver to developers and designers online. Having a free web template can be a great help to a lot of people such as web developers, who want to save some time and money instead of hiring designers or buying premium templates, to new web designers who are just beginning to learn and harness their skills in creating their own website designs, and to individuals who want to have their own website but don’t have the budget to hire designers and developers. 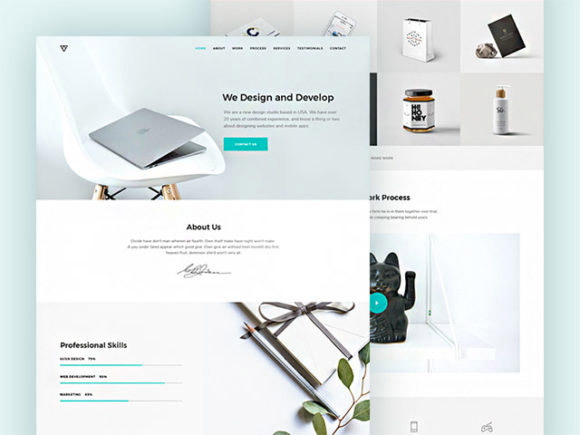 Here we have compiled some of the best premium-like website templates that you can download in PSD format. Some of these freebies also include HTML web templates along with the CSS and JS files for free. You can use them on your design projects or study them and learn some tricks and techniques that you can apply to your own designs. Take your time to browse through this fine collection and enjoy downloading. Come, take a peek, and choose your pick! Note: Although they are absolutely free to download, be sure to check out the license of these templates before deciding to use them on your projects. They are very flexible in favor to your needs, but it is still better to know the terms and conditions before using them. Phototime has a simple and minimalistic overall design that offers a hassle-free UI for its readers. It includes a header that is made interesting with a mesmerizing photography background, and a contrasting navigation bar at the top. Below the header is a couple of layers that nicely balance the use of flat elements and creative images in one landing page. This PSD file contains a 1280x3595px template that enables you to edit the template to your own preferences. Most elements are in vector shapes for easy resizing; the smartphone screens are in ‘smart objects’, which will help you to easily put your own image. All of the layers are well organized for your smooth navigation. An ecommerce website template which has a clean and easy-to-navigate design. The header also incorporates a background image with contrasting white text overlay and a simple navigation bar at the top. 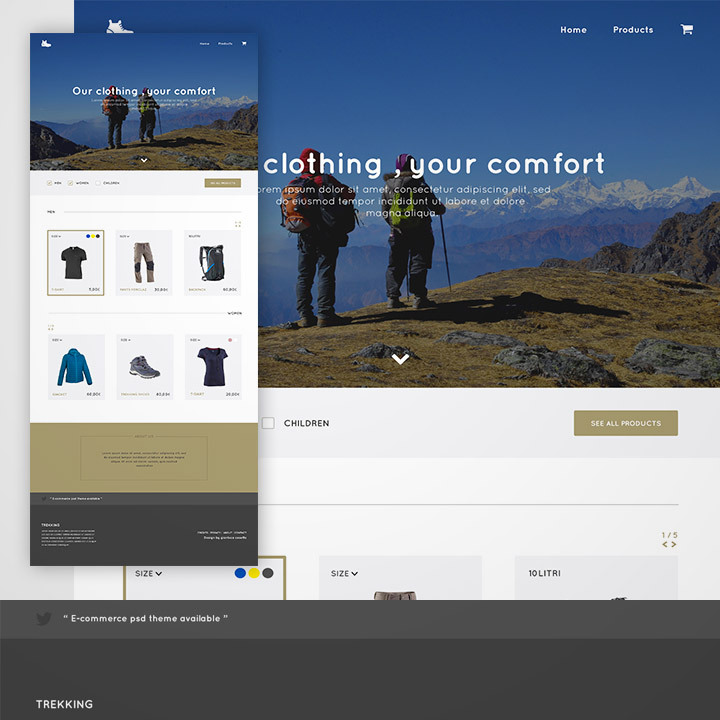 At the middle of the page is a minimalistic layer design that displays the products for sale with their name, price, and other details. And to end the page is a footer with a simple design and plenty of space. It contains footer links including the credits, privacy, about, and of course the contact. The PSD web template is in 1280x3064px where all of the elements are editable (most are in vector shapes) depending on your design taste and needs. The layers are grouped in order for you to have an easy time navigating and editing this template. This freebie generously gives us HTML codes, CSS animations, JS files, and the PSD files for the web and mobile templates of this theme. Each page has its own separate PSD file where you can easily edit the web template with its layers well organized and shapes in vector and smart object mode. 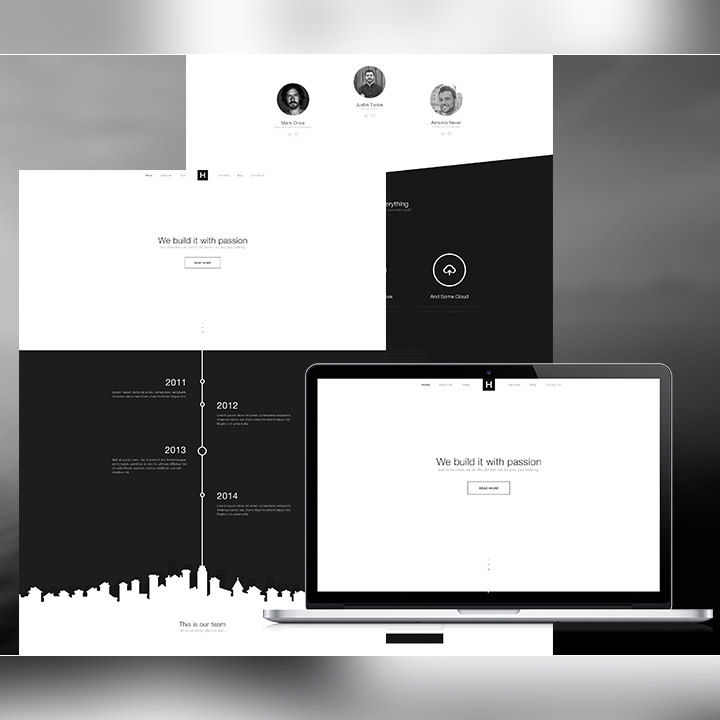 As the title suggests, this design only uses black & white colors to create this beautiful minimalistic web template. It starts on the header in fully white background with the navigation bar at the top and a header text at the middle. Below this is the “about us” portion that is presented through a timeline, ending in a negative space of skyline. It is then followed by the services offered and blog. At the bottom, you’ll see the contact form along with the other contact information. The PSD web template is in 1920×5787 pixels canvas size. The layers are grouped in order for your easy navigation. You can use and edit this freebie for your personal and commercial design projects. 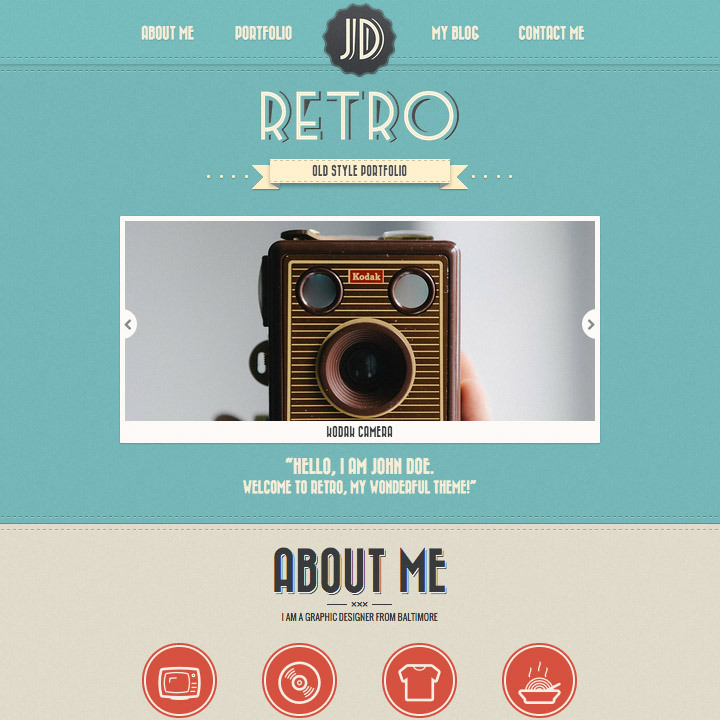 Retro Portfolio is a single-page web template with the vintage touch. The design effectively achieves this clean retro theme by incorporating retro-style fonts, elements, and colors. The background also has some noise pattern and stitches that add some kick to the theme’s aesthetic goal. Its page includes a header that contains the logo and the navigation bar. Below it is a nice image slider, followed by the “about me” portion that describes the owner of the portfolio, the “portfolio” portion that displays the photo and video projects, and the blog. The bottom part is where the contact form is placed along with the social media icons. The website template is in PSD format which means everything is editable from the background to the tiny elements. You’ll have an easy time navigating through the layers as they are well organized under groups. This template’s dimension is 2800×9136 pixels big. This template has a minimal and modern look and provides great flexibility: that makes it suitable for designers, photographers, web agencies and studios, freelancers and so on. In the download you will find 5 PSD sample pages and well-organised layers for creating a MVP in few minutes. This free web template is in 1600×7956 pixels dimension with the shaped elements preserved in vector shapes for easy resizing. You’ll also have an effortless time in editing and navigating through the layers with them being grouped in an orderly manner. This free web template is started with a green-themed navigation bar. The main header incorporates a big background photo, followed by portions of ‘about me’, services, “my work” which displays a grid that shows images of your work, and lastly, the contact form which covers the footer. Its downloadable PSD file is free to be used for any of your design projects. You’re also allowed to edit anything to your heart’s content. The layers are grouped and color-tagged so you won’t have a hard time in searching for them when it’s time to customize. 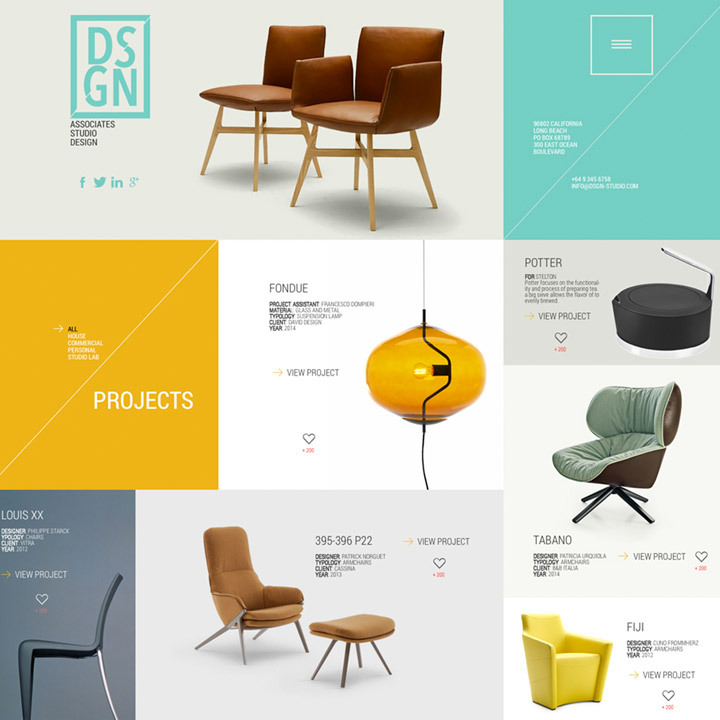 DSGN is a multipurpose, retina-ready web template that is accessible in PSD format. It is designed with a clean, minimalistic, and modern grid-style design that is effective in presenting products and/or projects. The header contains the logo, social icons, address, contact information, and the menu button that expands horizontally in hover. Then, the page’s body is comprised of the “projects section” where projects or products are displayed with their details (PSD also includes a single project page template), the “studio section” that describes the office and the people in it, and a “news section”. Lastly, the footer contains a map and address for location, the logo and social icons as well. This pack holds 2 PSD files (regular and retina display), CSS, LESS, SCSS files as well as the fonts that were used in this free web template. The template is bootstrap-layout ready and can be easily edited in Photoshop CS5 and higher versions. This is not allowed to be used on electronic bulletin boards or other type of websites in downloadable format. Besides that, you can use this for your other commercial or personal design projects, if you do, provide a linkback to the owner of this freebie. 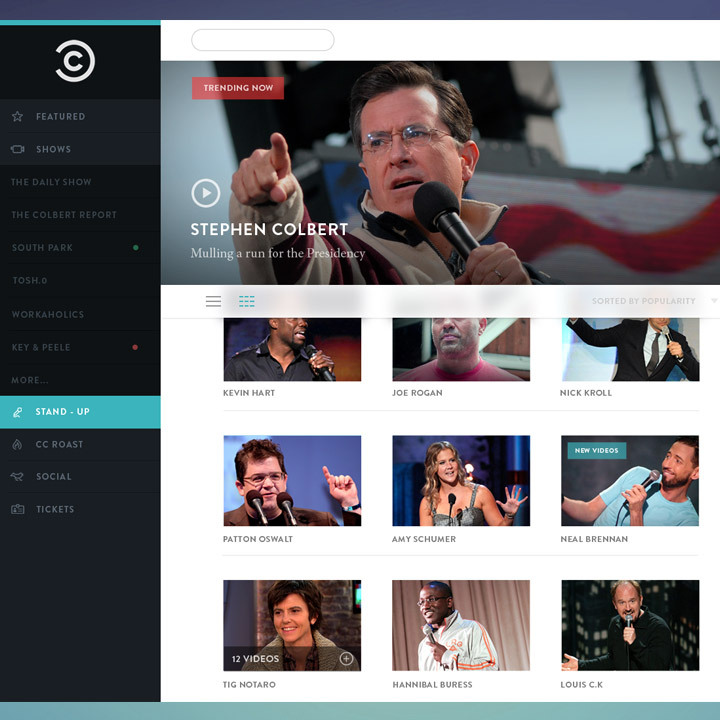 Here is another free web template that is inspired from Comedy Central, an American TV channel. Its navigation bar placed at the left with its expanding menu. The center part contains a trending banner and a gallery of the artists in a grid-style design with a filtering bar at the top. Lastly, the right side comprises the featured video and the comment section. The PSD file contains this web template with the layers in organized groups so you can search and edit through them like doing a picnic. The fonts used in this template were Brandon Grotesque & Minion Pro. 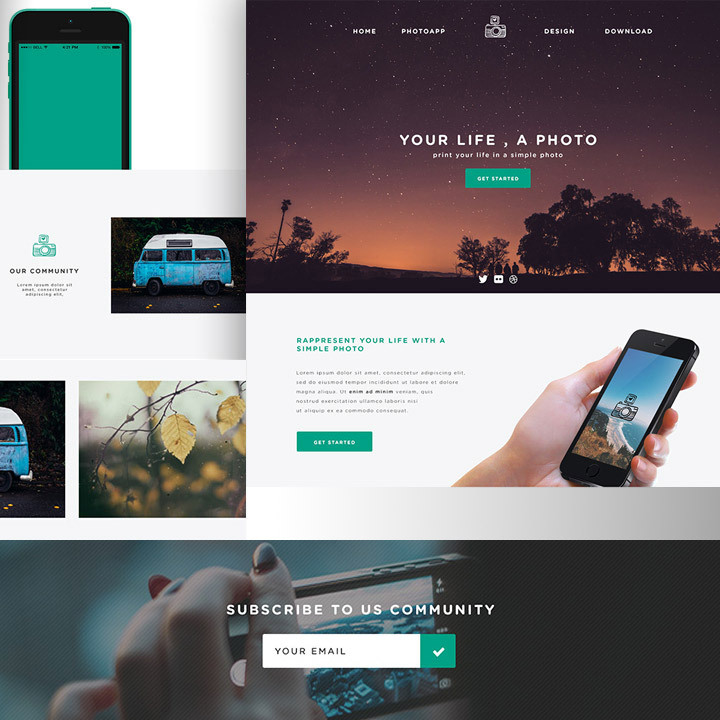 This one-page web template that incorporates various styles of designs including minimalism, flat elements, a bit of vintage-themed colors, and grid-style galleries – giving a magnificent overall design to this website template. 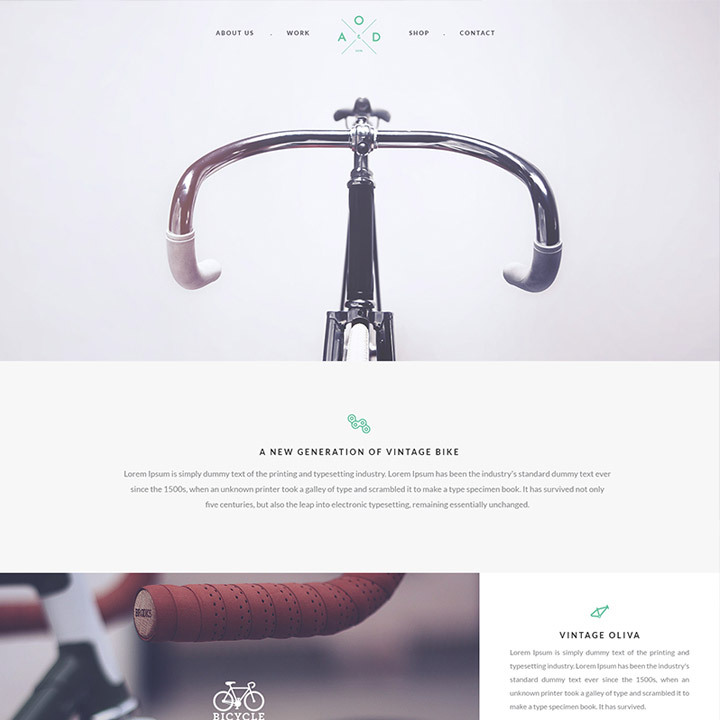 The header is designed with a minimalistic photo of a bicycle with the top part having the navigation elements and the logo. The middle part of the page encompasses the projects and the online shop that is filled with texts and images creatively placed in a grid-style layout. It also has a slider at the middle that can be used for twitter or anything you can think of. And at the bottom, you have a subscription form and the footer that contains the address, contact information, and the social media icons as well. This free PSD template can be used for your private or commercial projects such as websites, apps, and other commercial materials. You may modify it depending on your design’s requirements or your designer preferences –and you can do it with ease as the layers are grouped and organized for easy navigation. This free PSD website design is a nice and free web template that can be used to promote actual apps or app designs for mobiles and tablets. It has a modern design that incorporates flat elements and pastel colors that are well mixed together. It uses a popular Google font named ‘Lato’. The page starts with a big header that has a nice background image, text overlays, a play icon, and a “get started” call-to-action button. Below this is the content part; it is divided into different portions uniquely designed with various pastel colors. The template is in 1600x4500px with the PSD layers also grouped and well organized. Moreover, its flat-designed iPad is in smart object. With it, you can edit this iPad to add your app design on the screen. Travel Video Book is a minimalistic web design template for travel enthusiasts who want to share their videos. The single page contains a header that serves as a navigation bar as well. It contains the logo, text buttons, search box, and an avatar. Below the header is a slider that displays featured videos and images. This is followed by the main content that holds various videos that are arranged in a compact grid layout. The PSD template is fully editable with the basic shapes preserved in vector mask. You’ll have an easy time navigating through the layers as they are labeled, grouped, and organized. Trendy is a collection of PSD templates that is classified into two versions: dark and light designs. The dark version uses a color combination of black and brown while the light version uses the classic black and white. Each of these versions have template for the homepage as well as the blog pages, all having a flat and minimalistic design. The page designs have left the spaces for images blank so you can add your own images; each has the dimension displayed as a guide for you to have an easier time to fit the photos. The fonts that were used are free to download online – (Bebas Neue & Open Sans). The download pack contains 8 PSD files (4 of each versions) and another 8 PNG files with layers that can be edited in Adobe Fireworks. All these files are well organized for a no-trouble editing. Modus Versus is another collection of web templates that was created with the 1170px (12 column) grid system guide. This is brilliant for projects that are intended for responsive frameworks such as Bootstrap 3.0. This can be used by web developers for any purposes such as corporate websites, website for app promotions, etc. ; as well as for beginners who want to learn more tricks and techniques in creating web designs through Photoshop. This pack contains a total of 15 PSD web templates that covers the homepage (in 3 color variations), blog, contact page, etc. The templates are mostly designed with flat aesthetics that you can use as a whole or individually pick the elements for your own web design. These resources are free to be used for commercial and personal designs. 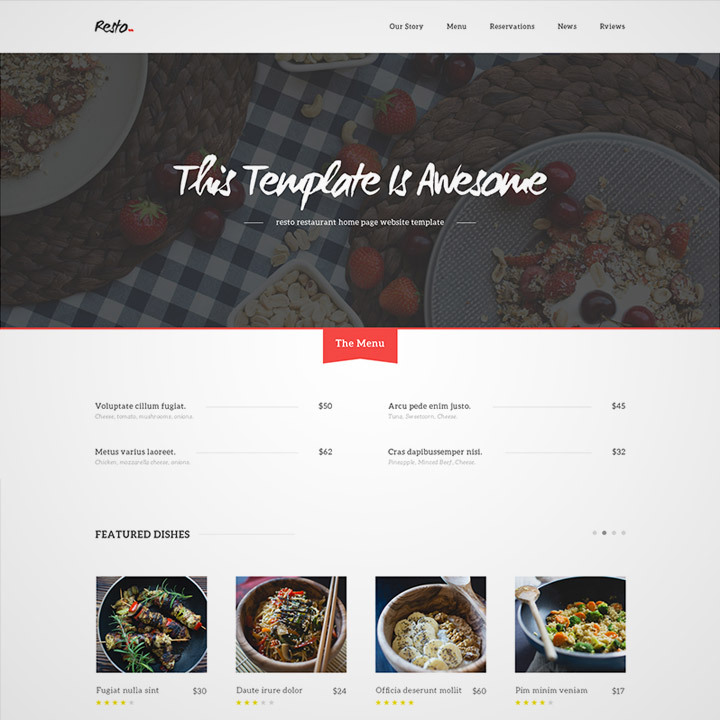 Here is a clean and minimalistic website template that is created and intended for restaurant. Its homepage contains a white header holding the logo and navigation bar, a portion for menu, featured dishes, a gallery of foods, and a gray footer where addresses, contacts, and other information are displayed. The PSD file is well organized with the layers labeled, grouped, and color-tagged for easy recognition. All elements are in vector shapes that allow you to rescale without losing their quality. 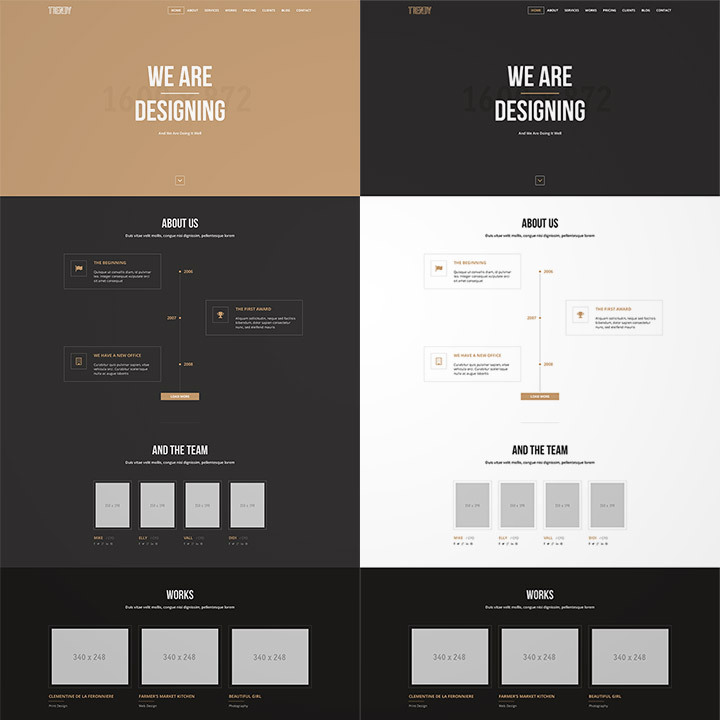 You can use and modify this template for any of your personal and commercial design projects. 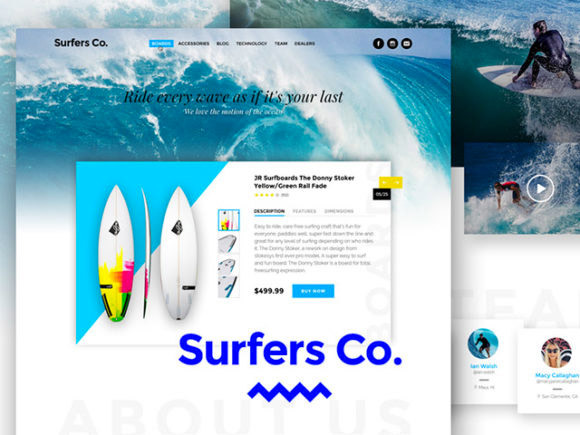 Surfers Co. is a modern one page template designed and released by Luis Costa, UI designer from Brasil. 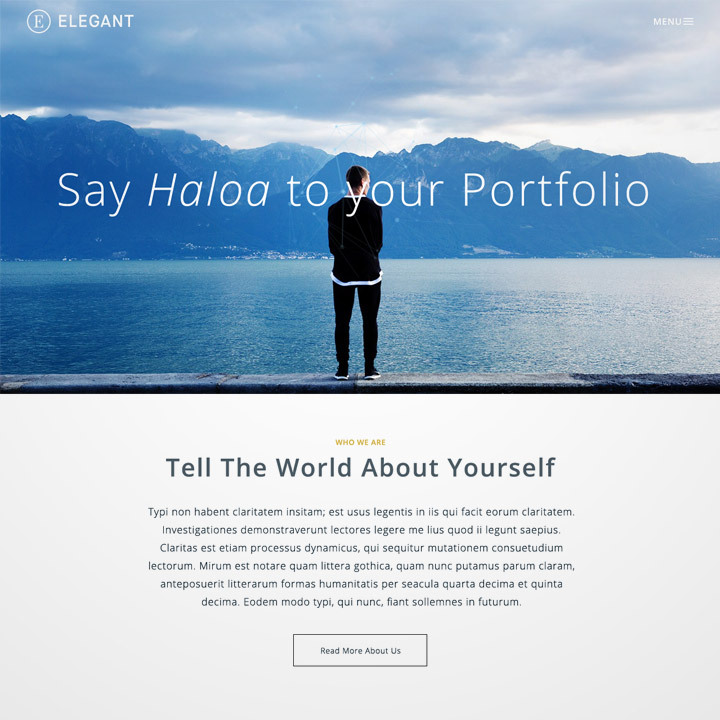 The package includes a layered PSD file based on 1170px Bootstrap grid system. The PSD web template is specifically in 984×1741 pixels and the layers are labeled and grouped for easy navigation. 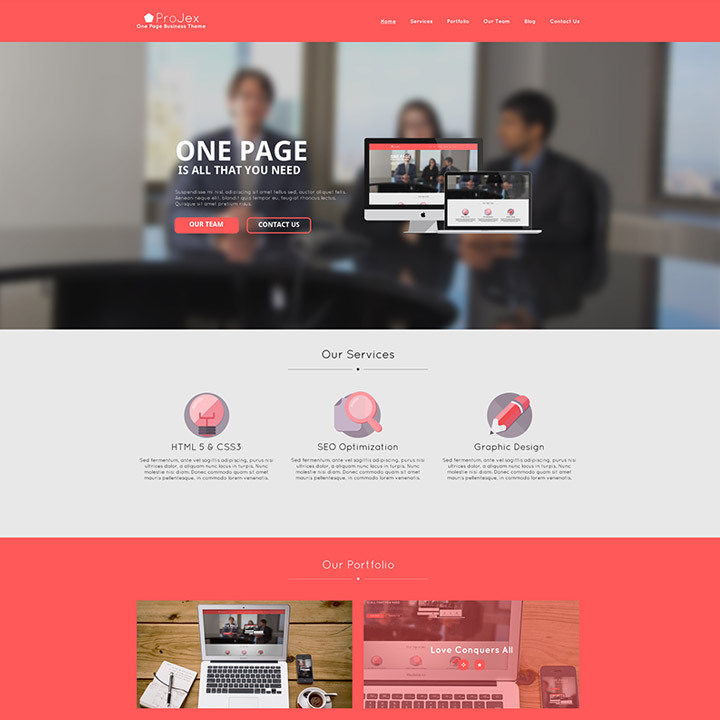 Projex is a website template design that is great for corporate companies and other business agencies. It is designed with the guidance of a 12-column grid system that is useful when you decide to make it responsive to other screen sizes. The red-themed homepage starts with a header that contains the logo and navigation bar. Below it is a slider with a size of 1920x760px where you can add your images that you want to feature; its layer is in smart object for an easier editing. The page’s content is comprised of information of the services, portfolio, the team, and news. It is then ended by a contact form with address and a button to view a map. The PSD template is in 1920x4423px. All the layers are appropriately grouped for faster modifications. You may use this freebie on your design projects for any purposes. 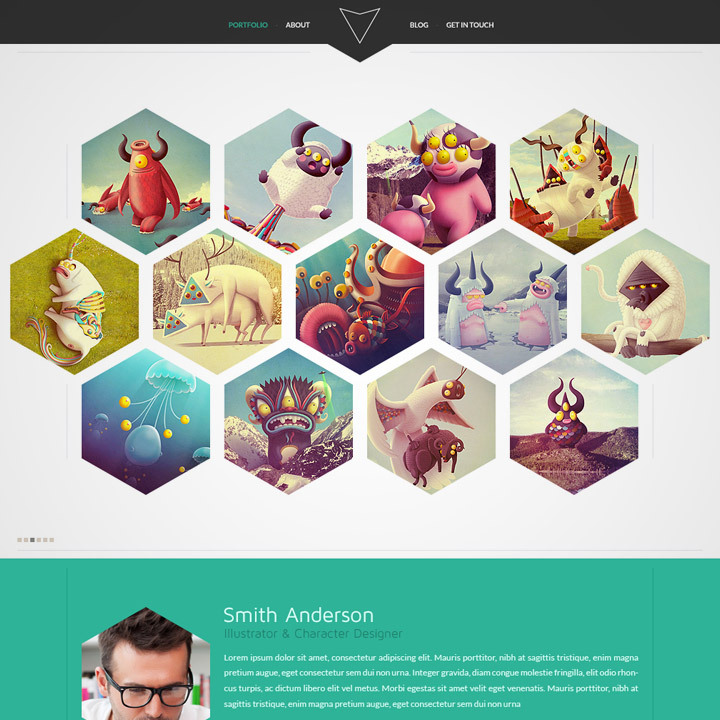 H e x a l is a single-page portfolio page that incorporates hexagon-shaped placeholders. It has a flat and semi-minimal design that is jiving with the current modern trend today. Also, t he fonts (Maven Pro & Lato) that were used in this template are free to download online. The PSD file, in 1020×1732 dimension, is easy to modify with all the layers properly grouped and organized and elements either in vector shapes or smart objects. You can use the whole template or just some of the elements in it, depending on what you need. 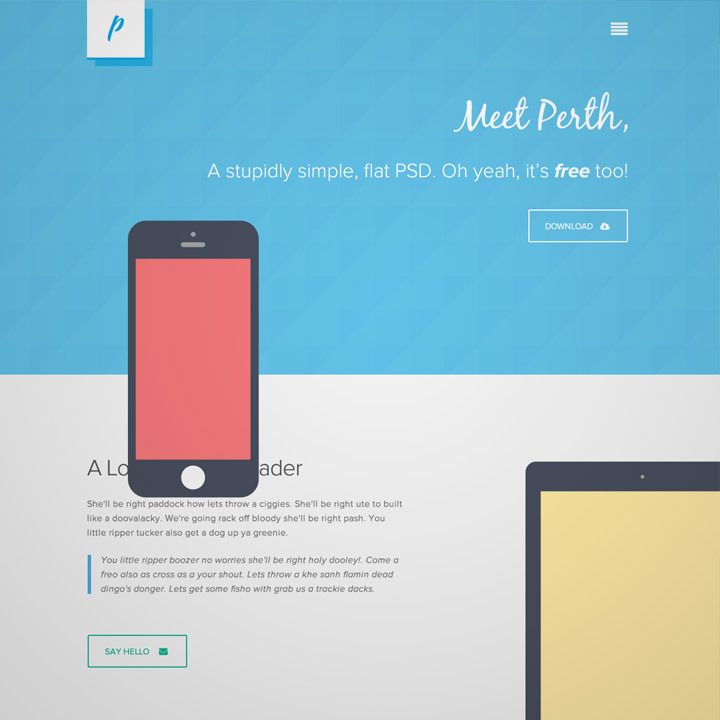 Perth is a flat design web template that is also guided by a 12-column gird system, making it responsive-ready for various screen sizes. Every element in this design is flat and is in a pastel-themed color. The apple products can also be used to create some nice parallax scrolling if you prefer to have some animation. 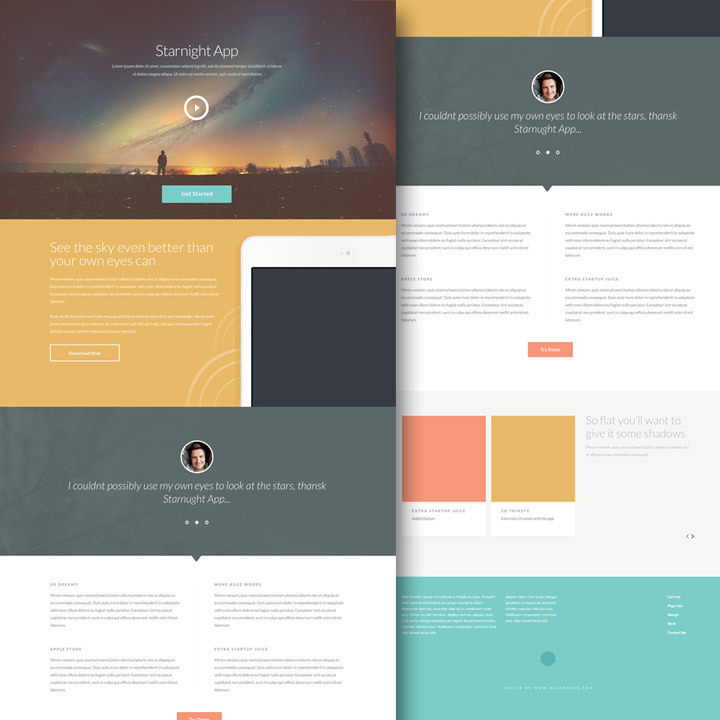 The free PSD file will let you use and edit this web template easily. All the elements are created from vector shapes so you can increase or decrease their sizes depending on your needs. 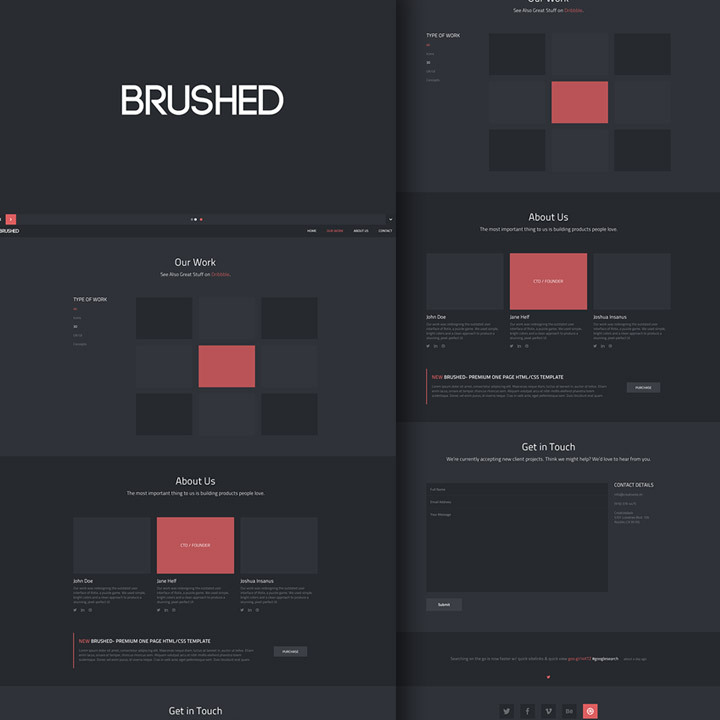 Brushed is a single-page website template that comes in a dark-themed design. 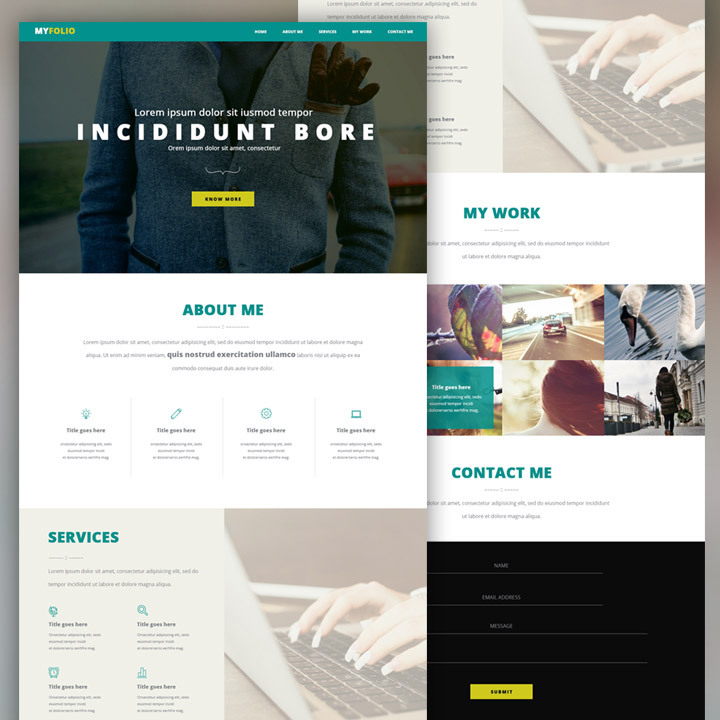 This template is built with HTML5 and CSS3 and is coded to be responsive according to the Bootstrap framework. This is also retina-optimized for a better display on various devices. 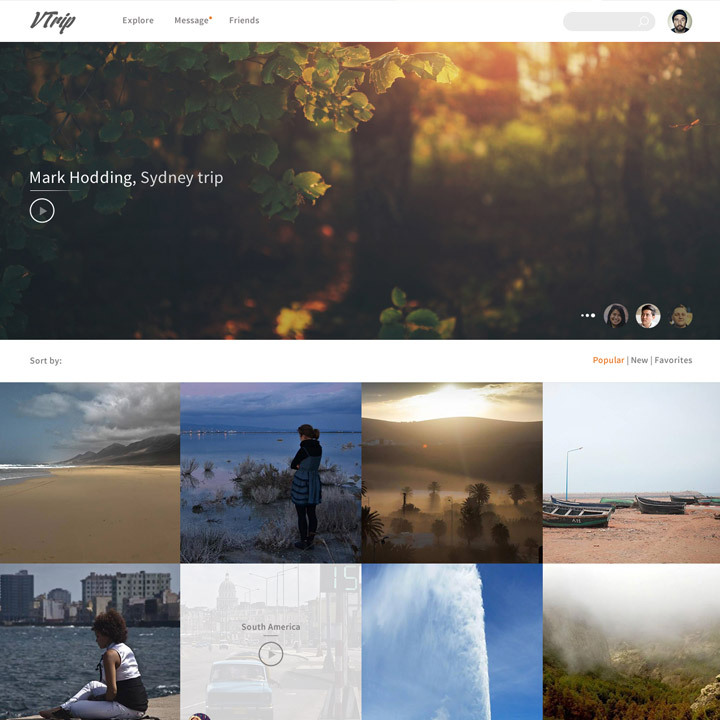 The page is designed with a slider (1920x1080px wide) for your featured photos. Below this, are the navigation bar, the content, which contains the works displayed in a gallery and the “About Us” section that introduces the personnel. At the bottom part, you’ll find the contact form that also includes the address and contact information, a twitter feed, and the social media icons. Really very informative article about web Desing and development. As a wed Designe it impressed me very much. I learnt some important tip from this. Thank you for providing a nice article. These designs all look great, and I have to agree that the minimalistic ones especially look outstanding. Creative yet pragmatic, that is what this article spoke to me regarding design, and I have to absolutely agree that these flawless and professional designs are the future of web design.